Having had the chance to check out Toshiba's and HP's impending enterprise-class notebooks, more and more I'm convinced spending up is the way to go when it comes to buying a notebook that both looks and feels like quality. While Dell's Precision notebooks are still a little boxy and aren't quite the ladykillers the new HP EliteBooks are, there's still something very austere and functional about them that puts consumer-grade laptops from any manufacturer to shame. If you're one of the people that didn't much care for Dell's new XPS line, these may be for you. 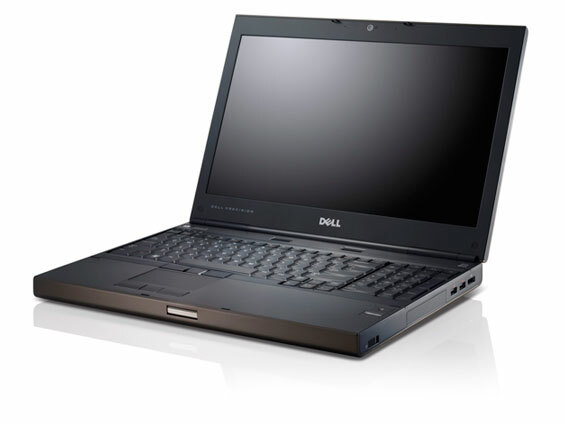 Dell has announced two new mobile workstations, the Precision M4600 and M6600, 15.6" and 17.3" respectively. Both are based on Intel's Sandy Bridge platform, supporting up to 32GB of DDR3-1333 (16GB of DDR3-1600) in four DIMM slots along with ramping all the way up to the 55-watt Core i7-2920XM, and each offers a range of choices from AMD's FirePro Mobility GPUs and NVIDIA's Quadro GPUs. Best of all, Dell is offering bare-minimum 72% gamut displays on each of these notebooks along with an optional upgrade to an IPS RGB-LED display on the M4600. Let's break them down. The 15.6" Precision M4600's screen options start from a basic 1366x768 screen, move up to a multi-touch enabled 1366x768 screen, then on to a 1080p screen, and then finally Dell's PremierColor IPS RGB-LED backlit 1080p screen. GPU options include the AMD FirePro M5950 Mobility Pro with 1GB of GDDR5 (GPU equivalent to the 480-shader Radeon HD 6670), the NVIDIA Quadro 1000M with 2GB of GDDR3 (GPU equivalent to the 96-core GeForce GT 540M, depending on the clocks), and the NVIDIA Quadro 200M with 2GB of GDDR3 (GPU equivalent to the 192-core GeForce GTX 460M, but without GDDR5 and only a 128-bit memory interface). Additionally, the M4600 can be configured with a 128GB SSD mini-card to supplement the hard drive; two 128GB SSDs can be configured to run in RAID 0 or RAID 1. It offers virtually every type of connectivity under the sun: gigabit ethernet, 802.11n, Bluetooth 3.0, WWAN, 2x USB 2.0, 2x USB 3.0, FireWire, eSATA, HDMI, DisplayPort, VGA, ExpressCard/54, and a SmartCard reader. The M4600 starts at $1,678 and will be available on May 10th. Moving up to the Papa Bear, the 17.3" Precision M6600 brings to bear all of the same processor options and connectivity as the M4600, but graphics, display, and storage options are improved. This time, the display starts at a basic 1600x900 panel, but can be upgraded to a 1080p display with or without multi-touch capability. It won't be launching with an IPS display option, but Dell expects availability soon after. Graphics get a boost as well, allowing the following: the AMD FirePro M8900 Mobility Pro with 2GB of GDDR5 (GPU equivalent to the 960-shader Radeon HD 6970M), the NVIDIA Quadro 3000M with 2GB of GDDR5 (240 cores, likely using a GF106/GF116 die, which means roughly GTX 470M with more bandwidth but fewer cores), the NVIDIA Quadro 4000M with 2GB of GDDR5 (336 cores, again with a GF106/GF116 core, but now surpassing GTX 470M), and topping out at the NVIDIA Quadro 5010M with a whopping 4GB of GDDR5 (a full 384 cores, a full-fledged GF104/GF114, matching up with the GTX 485M). Besides the graphics and processor choices, the M6600 adds a second 2.5" drive bay to go alongside the first bay and the offered 128GB mini-card SSD, and these three can be configured together into RAID 0, RAID 1, or even RAID 5. The M6600 starts at $2,158 and will be available on May 10th. 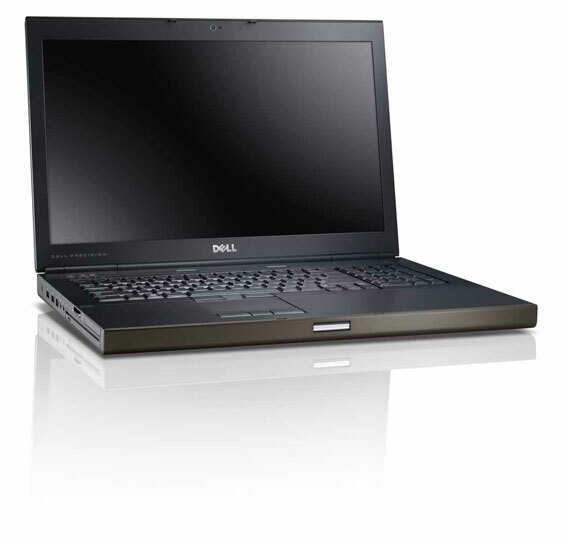 Besides these two notebooks, Dell is offering the Precision R5500 rackmount workstation. This monster is capable of supporting up to five full-length, full-height PCIe x16 cards, dual graphics cards, up to 192GB of memory, up to five SATA drives and six SAS drives, and runs one or two Xeon 5600 series processors. These chips are still based on Westmere technology as opposed to Sandy Bridge, but combined can allow for a total of twelve physical cores and twenty-four logical cores. The R5500 starts at $2,551 and will be available in the states and Europe on May 3rd, showing up in the Asia-Pacific region a week later on the 10th. Where's a 15.6" laptop with Sandy Bridge and a GTX460 that has a 1080p display with over 500:1 contrast ratio and 5+ hours of battery life on internet? Like that Clevo but with a not sucky keyboard. Or like the Asus you have yet to review except... well idk if it has flaws cause you haven't reviewed it. I'm using a Precision M4500, and I will say it doesn't feel like it has anywhere near the build quality of HP's enterprise line. Or a Macbook Pro for that matter. It still has that Dell plastic feel to it, and it was pretty damn expensive to boot at €3000. I also have an M4500 (being I work in a dell shop). Certain aspects of it are, others are kind of bleh. I actually held out buying one for ages waiting for the M4600, and finally got to the point to where I could no longer weight. So I got this in February. I should note that "Dell Shop" is not a Dell operated company, but rather a company that has a service contract with Dell, so mostly purchases Dell hardware.